Our little guy Bentley learned how to climb out of his crib a few weeks ago and it’s really thrown us all off our schedules. Come nap time, he’s exhausted, but the second he’s put in his crib, he immediately climbs out. And nighttime? He climbs out at least 15 times before he’ll stay put. He’ll also make a nightly visit to my room to say hi around 3-4 am which I thought was cute…the first time. So, we tried a different crib we’d been storing — this one much taller than his last. That didn’t work. Next, we removed the metal base and put the mattress on the floor with the crib safely secured around it. He still climbed out. And finally, the husband (safely) attached some boards to the sides, so if he tried to pull himself over he couldn’t get out. That worked for a few days until he figured a new way out. With each change to the crib, it felt like he was anxiously awaiting a new challenge and he’d get giddy when he could figure his way out. An overtired baby and toddler has not been very fun. Naturally, lots of chocolate cookies have been in order to cope with the lack of sleep around these parts. This past week, we finally made the investment in a crib tent canopy cover (seriously why are those so expensive!?!) which has finally stumped our little escapee. Now he’s sleeping again along with everyone else in the household. And….I’m still making these cookies. What started as an excuse for some much needed sugar, chocolate, caramel, and butter has now turned into a slight addiction. These cookies are insanely good! 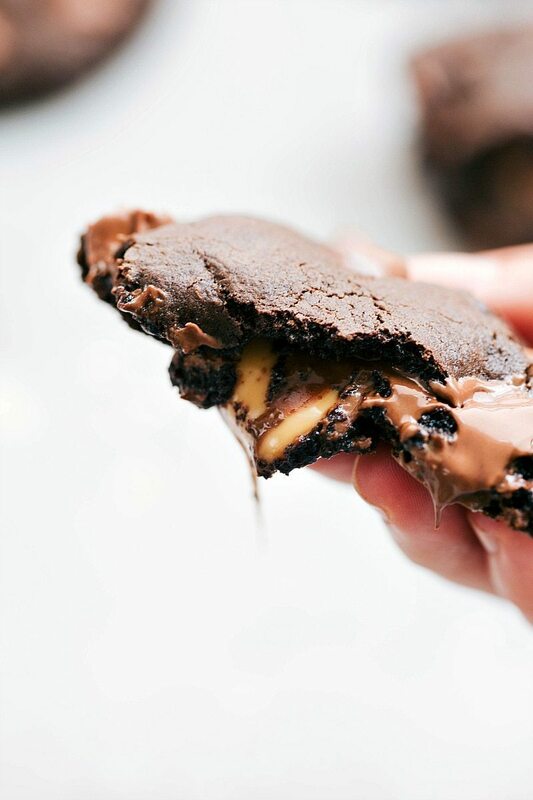 What makes these caramel filled chocolate cookies the BEST? 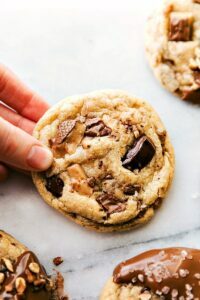 Two kinds of chocolate chips: these cookies call for regular milk chocolate chips and miniature chocolate chips which adds texture and dimension to the flavor. 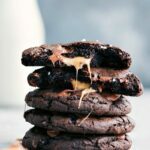 A soft caramel filling that also adds in some chocolate: these cookies have an unwrapped rolo in the center which adds more chocolate and the caramel stays the softest. Even when these cookies are 100% cooled, the caramel doesn’t get hard! 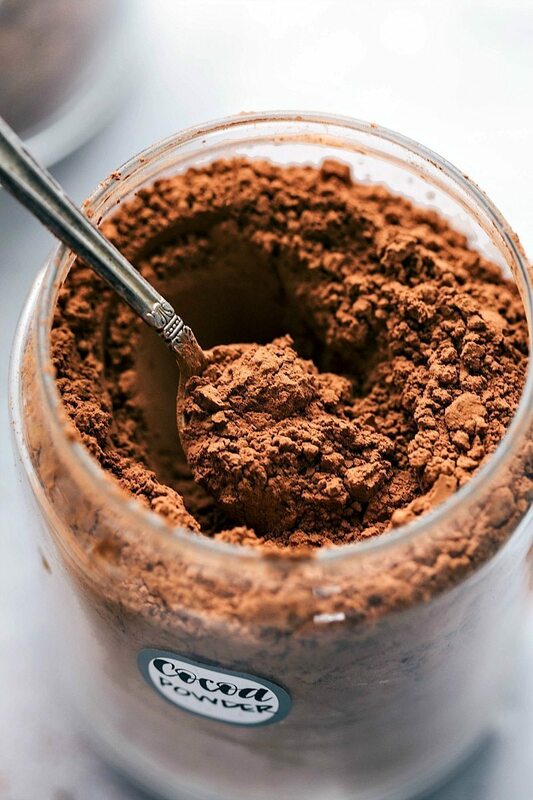 Two kinds of cocoa powder: these cookies have regular unsweetened cocoa powder AND dark cocoa powder which adds so much depth to the flavor. The “secret ingredient:” these cookies call for sour cream which is the “secret ingredient.” Sour cream makes these cookies ultra soft & chewy. 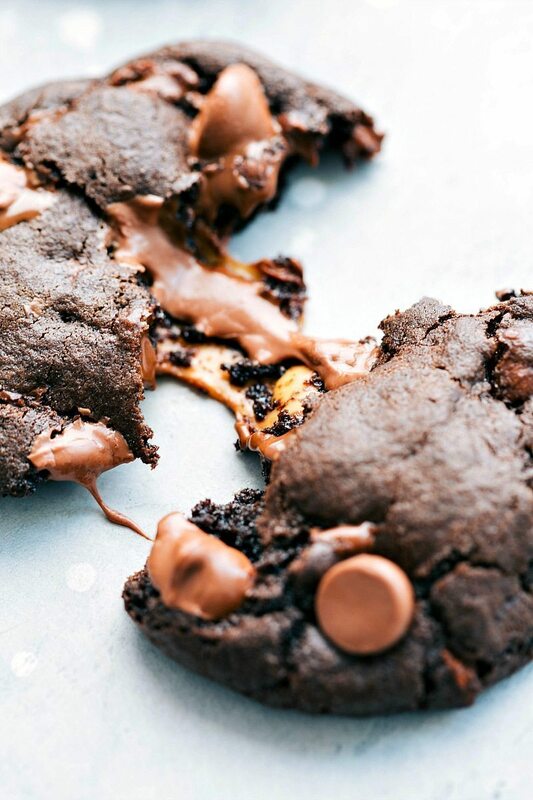 The cookies literally melt in your mouth! 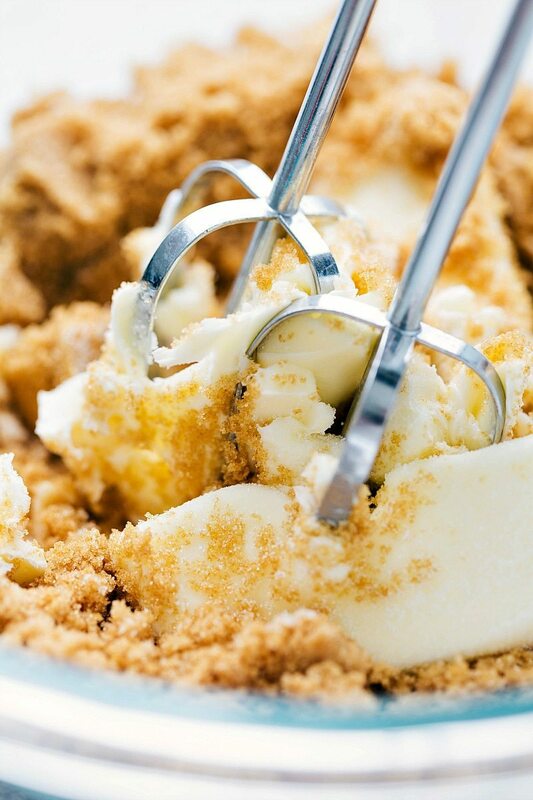 Two kinds of extracts: vanilla extract is usually a given for cookies, but these cookies also have almond extract. It might sound weird, but you’ll be amazed how well the almond accentuates the other flavors. It goes so well with all the chocolate and caramel. Chilled dough: This dough get chilled for a bit before baking which allows all of the ingredients and flavors to meld. Just like marinating meat before you cook it makes it more flavorful, the same with these cookies. It allows the flavors to meld together and get more flavorful. 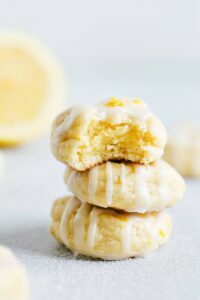 Using REAL butter and beating it with the sugar: Butter gives these cookies body, texture, and flavor. 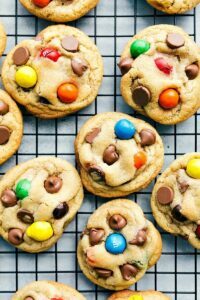 By beating it with the sugars at the start you’re fluffing up the butter with air which gives these cookies that perfect foundation for a great texture. In a large bowl, cream butter, white sugar, and brown sugar until light and fluffy (the mixture should resemble peanut butter). Beat in egg, sour cream, almond extract, and vanilla extract. In a separate bowl combine the flour, unsweetened cocoa powder, special dark cocoa powder, baking powder, baking soda, and salt. Stir to combine. Add in both kinds of chocolate chips and stir once more. Combine wet and dry and mix until JUST combined being careful to not overmix. Cover the dough and chill for at least 30 minutes and preferably 1 hour. Preheat the oven to 350 degrees F (or 325 degrees for convection bake) and line a large tray with parchment paper or a silpat liner. Measure rounded tablespoonfuls for each cookie and then roll an unwrapped rolo into the dough. Make sure the rolo is completely encapsulated by the dough. Place the cookies two inches apart. Add a sprinkle of salt to the tops of the cookies here if desired. Bake at 350 for 10-15 minutes or until set (just until the top is no longer "glossy"). Be careful to not overbake. A soft, very slightly underbaked cookie is the best for a delicious fudgy texture! 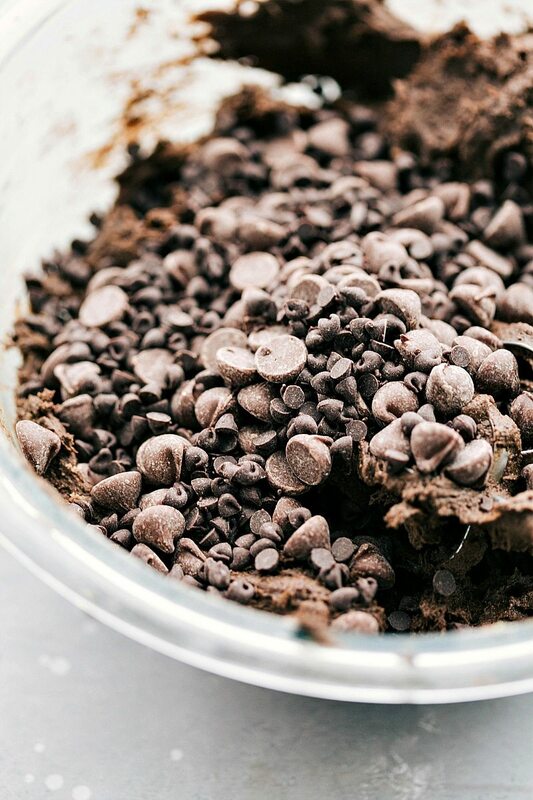 Once the cookies come out of the oven, you can press a few more chocolate chips into the top if desired and add any additional salt if desired. Cool for 15-20 minutes before enjoying. Special thanks to REAL Butter for sponsoring this post! As always, all opinions are my own. 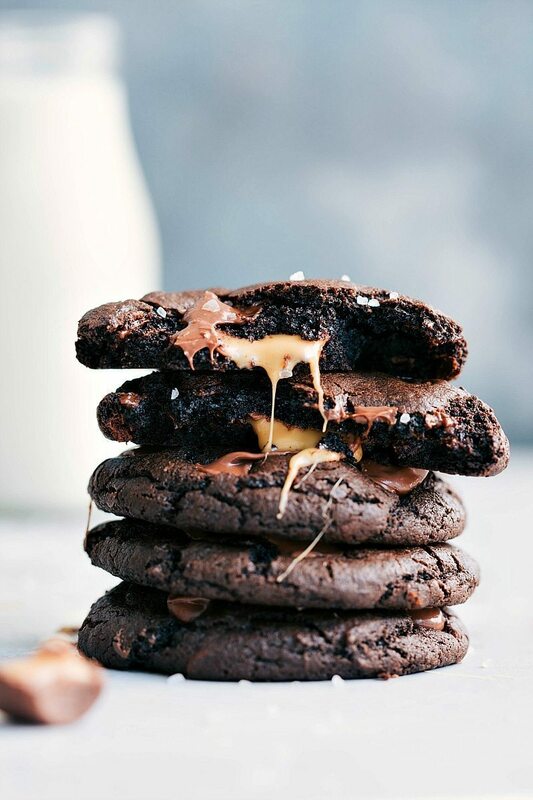 Would you be able to make these without the caramel? I can’t seem to find Hershey special dark anywhere. Is there a substitution?